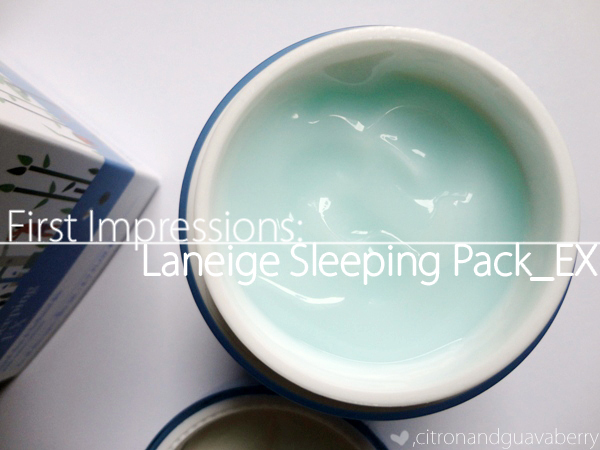 Alright, basically Laneige claims this product is a "overnight mask pack", and it's "light gel-type texture gives intensive hydration, vitality, and brightening effect while restoring skin with deep relaxation through aroma scent. [Use once or twice a week]." It comes in a 80 ml tub, and I got mine for about $29 CDN at Amore Pacific (at PMall). You may be thinking, "An overnight mask pack? Light gel-type texture? Deep relaxation through aroma scent??? What does this all even mean?" Vague claims are vague, but I basically just use it as a regular moisturizer...a few times a week or whenever you need it. ...Also, I literally only just read that you're supposed to use it once to twice a week....after using it almost daily for a week and a half. Oops, YOLO. I really need to stop using memes. In my defense, I can't stop using it! It gives me soft and glowy moisturized skin the morning, which rivals the moisturizing properties of using olive/jojoba oil on my face! The redness around my acne hyperpigmentation has also been reduced because my skin is actually getting the intense deep moisture it needs, which is something normally oil would do for my combination skin. It worked so well for me I encouraged my brother to use it. My brother suffers from eczema that, for SOME REASON, he refuses to care for regularly. He had loads of dry patches on his face (eye on his eyelids, seriously), and I told him to use an exfoliator BUT NOoOOo HE DOES NOT LISTEN. But fortunately, he listened to me with this product, and after 2 days of using this product daily, we both agree there's been improvement. Overall redness on the face has been reduced, less severe dry patches, and he's left with nicely moisturized skin. It's still a work in progress, but it's only been 2 days!! Basically, it's amazing for both my whack dry-oily combination skin, as well as soothing for even the driest, eczema-inflamed skin. If even my brother, the laziest in terms of skincare maintenance actually takes time and effort to apply this on his face, you know it's good. If you're on the hunt for a water-based moisturizer that really delivers deep moisture to your skin, I really do suggest looking into this one! But if you already have a fantastic moisturizer that works for you, then huzzah, you've found your holy grail! YESSSS. I was going to ask you on how the Sleeping pack was going - but bam! First impressions review! Woohoo! *u* So glad it worked out well for you (and your bro) too! It's heaven in a tub, I say! Totally jealous that you can get such amazing products where you live so easily! The only Asian brand I've tried is Shiseido (which doesn't count cause its so main stream) so I've been wanting to try other products! This will definitely be something I look at when I go back to Toronto! Never heard of the stuff, but I loved your review. YES! I love when people are unashamedly excited about things. I may try this, though the price is steep, but if your brother is going out of his way, my dry skinned lazy self would. Great review! Or check eBay! There's some authentic sellers on there, and it's a bestseller, so there's bound to be lower prices! Oh wow. That sounds really good! May have to test it out since I get oily skin during the day, but if it works for eczema then it should be good for me. Yeah, testers/samples are a great way to test drive a product! A lot of people said it works for their oily skin, but I don't get too oily anymore, so definitely get a sample! The price varies depending on where you live! It's ~$22 USD on Amazon, which I suppose is a bit steep, but holy crap, worth every $$ if you've got dry skin, heh. LOL, no, don't stop using memes. I want to start using them more often actually. Beauty blogs can sometimes be too serious or girly, which is fine, but I like my beauty with a side of comedy (regarding blogs...not my face). Regarding this moisturizer, I've never heard of it, but I'm always interested in hearing about water-based moisturizers for my oil slick of a face. Akljdslkfsdf, I love gifs, but memes, hrm. 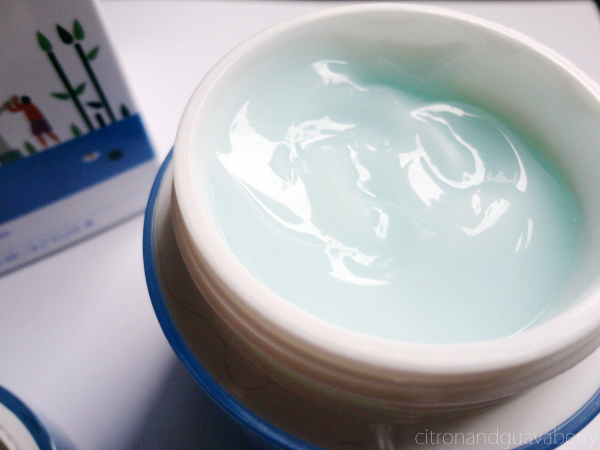 Yeah, it's a Korean brand, and another water-based moisturizer I want to try/compare it against is Clinique's Moisture Surge Intense! hahah YOLO to using it more than 3 times. i dont think it would really matter though . dude. still w/o internets. IM LE DYING! Oo I like the sound of this and I really need a hydrating moisturiser that doesn't break me out.. but I can only buy this online so boo! I'm not a fan of buying products online.. mixture of my impatientness and delivery charges!